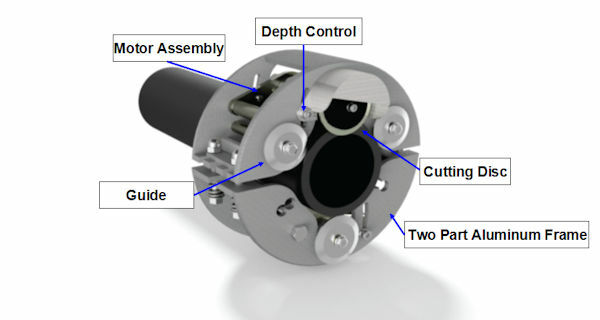 Compact hand-held circumferential cutter for ductile mains. Cut 4" ductile iron main in about 2 minutes. Use on gas, water or conduit pipes. 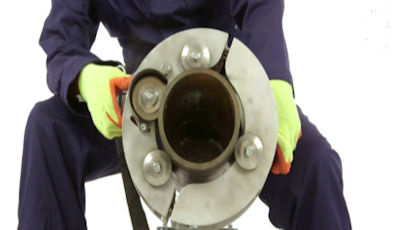 Two aluminum shells connect in seconds, forming a circular frame around the pipe for accurate cutting. 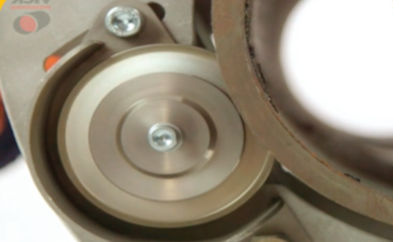 1/2" maximum cut depth Safe: Cutting blade is mounted away from operator's hand. Trigger handle equipped with automatic release. Economical: Easy one-man operation, requires little training. Innovative: Motor contained in top shell. Uses one cutting disc for all pipe sizes. Includes 3 different frames to handle 3"-4", 6" and 8" pipe diameters. Air Powered: Connects to a typical air compressor using a special air filter and lubricator unit for smooth operation and long service life. Requires a minimum of 17 CFM at 100 psi air supply. Exhaust: Design diverts air exhaust away from operator and prevents debris from blowing around the trench. Precise: Depth control disc stops the blade from cutting too deep. Prevents damage to internal pipe or wire. Ideal for use in Live Mains Insertion and dead insertion projects. Convenient: Needs less than 6" clearance around the pipe to operate.